Turn grilled chicken into these Cheesy Grilled BBQ Chicken Wraps in three easy steps. 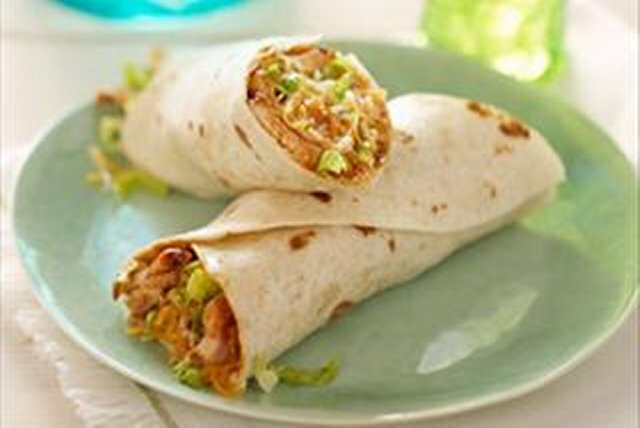 Wrapped up burrito-style, barbecued chicken, cheese, lettuce and flour tortillas make for a great 20-minute entrée. Grill chicken 6 to 8 min. on each side or until done (170ºF), brushing with 1/4 cup sauce the last 3 min. Cut into strips. Spoon remaining sauce down centres of tortillas; top with chicken, cheese and lettuce. Fold in opposite sides of tortillas, then roll up burrito-style. Add chopped fresh parsley or cilantro to filling. Or serve topped with sour cream. Stack tortillas; wrap in foil. Grill alongside chicken 2 to 3 min. on each side or until tortillas are warmed.